Elsie and Victor Machle in China, undated. Between 1975 and 1980, I lived in Baltimore, Maryland, across the street from Victor Machle and his sister, Elsie Machle White. When Elsie died on January 29, 1978, she left a treasure-trove of letters and a small notebook that recorded the sender, date of receipt, and date of response for each. The letters span 70 years and include early Machle correspondence from China to relatives in the United States. My name is Georgene Searfoss. I spent hours in the Machle home at 501 E. 42nd Street talking with Elsie about her past. 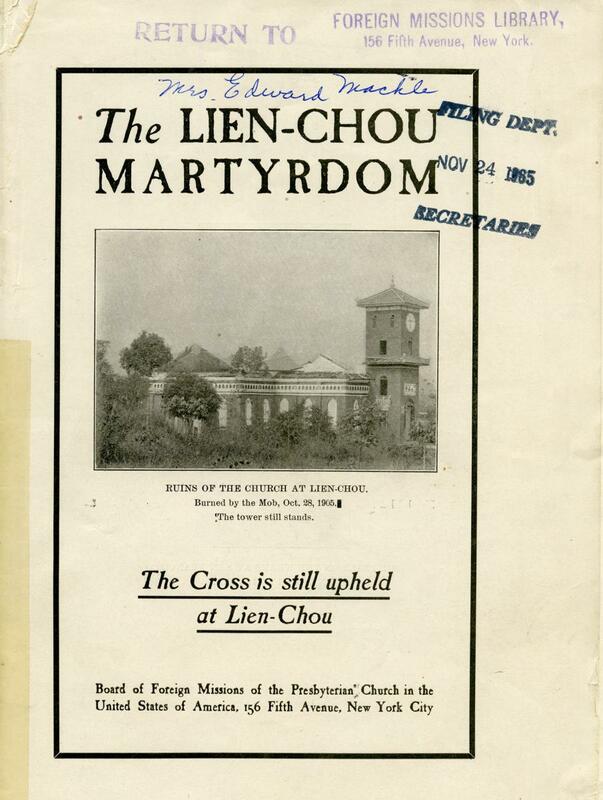 Many of her stories connected with the killing of five Presbyterian missionaries in Lien Chow, China, on October 28, 1905. Her mother, Ella, and younger sister, Amy, were among the victims of that mob massacre. Dr. Machle, Elsie’s father, survived the incident by hiding underwater in a cave inside a Buddhist temple. Cover of publication by Arthur J. Brown, the Willett Press, undated. From RG 360: Machle, Mrs. Edward C. (Ella M. Wood). Up until now little has been written about Elsie’s mother. A diminutive woman with brown hair and deep-set brown eyes, Ella May Wood met Edward Machle at Wharton Street Presbyterian Church in Philadelphia in the 1880s. Ella worked as a teacher. Edward was a student at the Medical College of Philadelphia. Although his future bride never attended college, she had an unmistakable gift for teaching young people. After marrying, the Machles received appointments to serve the church overseas with the Presbyterian Board of Foreign Missions.. Upon arriving in Canton, China, the Machles were trained in the culture, customs, and speech of the Northwest Kwongtung Province . Despite this preparation, the five different languages spoken in China at the time made it difficult for Ella to communicate with people on the street. Her first child, Elsie Edelman, who was born on May 3, 1890 (also her father’s birthday), had a greater facility, proving herself particularly adept at speaking with her Chinese playmates and otherwise fitting in; she even began to braid her hair in the native pigtail fashion. Although Elsie’s desire to speak Chinese instead of English concerned her mother, she benefited from her daughter’s linguistic range during visits to the market and while carrying out other errands in town. There were three other Machle children: Victor, born in 1892, and the twins, Amy and Howard, born in 1894. Howard would die from diphtheria in 1904. 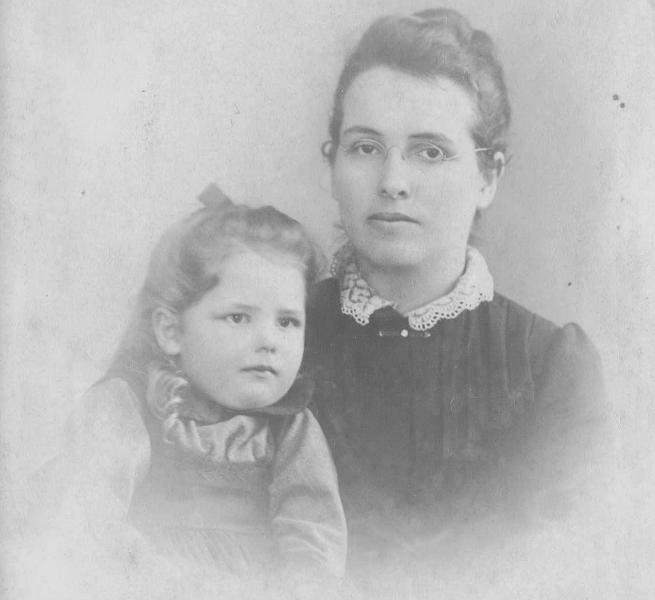 Elsie and Ella Machle, 1893. In 1897, Edward, Ella, and their children returned to the United States on missionary furlough. While there, the parents made educational arrangements for Elsie and Victor at the Presbyterian Homes for Children of Foreign Missionaries  in Wooster, Ohio, an academy that taught the children of foreign missionaries. Like all the boarding students, Elsie and Victor lived in homes known as “inkys” (incubators), Victor in Livingstone Home, Elsie in Westminster Home. Two housemothers made decisions about the Machles’ education, health, and social needs, with each woman writing regularly to Ella with reports on her children’s welfare and learning. All students were expected to write to their parents once a week. A November letter from Ella to Elsie included a request about Victor, the only Machle in the school’s Livingstone Home. “My dear girlie, I often feel as you do that I would give anything to see you and Victor, but I know it is best for you to be in the homeland and I feel sure you will make good use of your time. Do help Victor all you can my dear. Be a good kind sister to him. Do not scold him, but love him into being good. My heart is very sad when I think of him, but I know the Lord is as near him in America, as he would be in China, and as ready to help him and you to live such lives as will please him.” Elsie would honor her mother’s request for the rest of her life. 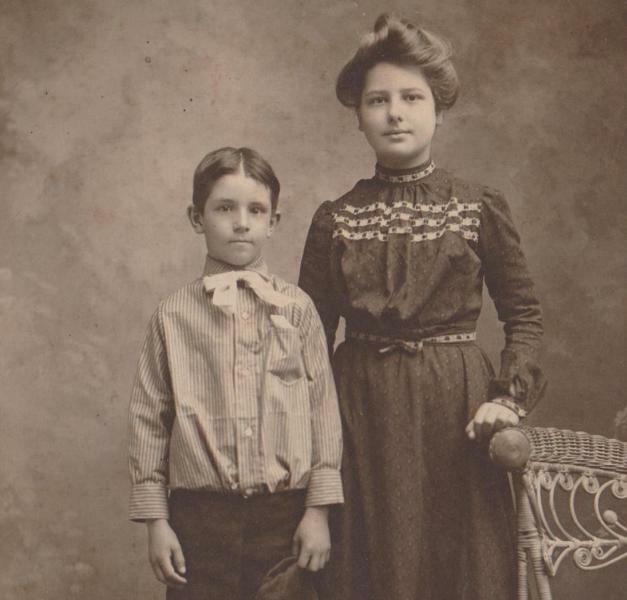 Victor and Elsie Machle in Wooster, 1904. On August 22, Ella wrote to Elsie in the aftermath of a disappointing school report in Latin, and of ways she could improve her studies generally. ”[I]f you expect to be really intelligent, you must apply yourself diligently and do not skim over things satisfied if you can pull through in a recitation. Pitch in my dear and make it up…. 'Nothing is gained without pains, except dirt and long nails.’” Later in that letter there are several lines about not being in a rush to grow up. “ Do not try to be a young lady too soon. Be a girl as long as you can.” Read today, these words have added poignancy. Ella Machle would not live to see another year. Her last letter to Elsie was written in September 1905. In it, Ella shares her joy that Victor had finally written home. 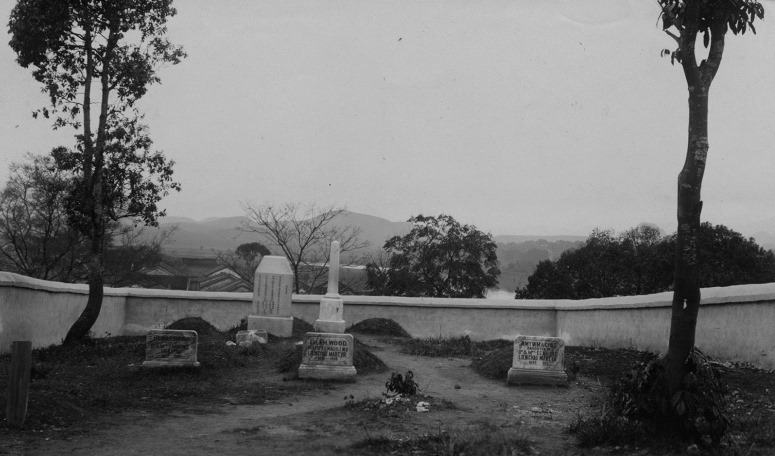 Cemetery near Lien Chow where members of the Machle family were buried, early 20th century. As I look back on Elsie’s life, it is clear that the lessons Ella taught in those letters made a lasting impact. Elsie Machle completed her college education at Wooster, received an M.A. degree from Columbia University’s Department of Biology, and was constant in her correspondence to family and friends. She returned to China in 1921 for a year, where she translated English medical volumes into Chinese for Hackett Medical College for Women . She became known as a Chinese expert and co-authored a book in 1945, “Our Neighbors, The Chinese” under the pen name Vaughan White. She later taught Chinese at Grace & St. Peters’ Episcopal Church in Baltimore and worked at Church Home Hospital. Victor moved to Baltimore in the 1950s and lived with his sister. Until her death in 1978, Elsie was dedicated in caring for him, as her mother had wished. Guest blogger Georgene Searfoss is the wife of a retired United Methodist minister and served as Chairperson on The Board of Diaconal Ministry in the mid 1990s. A B.A. in Business Administration from Notre Dame of Maryland University, and an M.A. in Counselor Education from Pennsylvania State University, she now spends her time researching and writing. She lives in Spring Mills, Pennsylvania. Papers, photographs, and publications at the Presbyterian Historical Society document the Machles' missionary service and the larger Presbyterian mission presence in China. Email the reference staff at [email protected]  for more information.